Duff Anderson toils long hours in the sun alongside his fellow black railroad workers. At a church meeting, he meets schoolteacher Josie Dawson, who is the daughter of Preacher Dawson. The holy man is strongly opposed to a burgeoning romance but is powerless to stop Duff and Josie from marrying. Having tied the knot, the couple looks forward to a bright future but the prejudices of the townsfolk coupled with Duff and Josie's own insecurities threaten to tear the marriage apart. 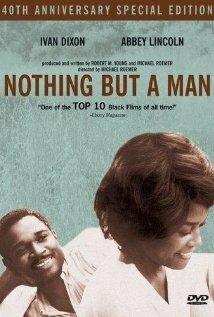 Nothing But A Man is not currently showing anywhere.